Half already hit by uncertainty, with one in five having lost business and a third cancelling or postponing UK investment decisions. Impact on profitability, ability to win overseas business, investment in UK operations and workforce cuts cited as biggest ‘no deal’ concerns. Withdrawal agreement offers breathing space to negotiate ambitious future relationship and frictionless trade – essential to safeguard UK automotive industry and jobs. 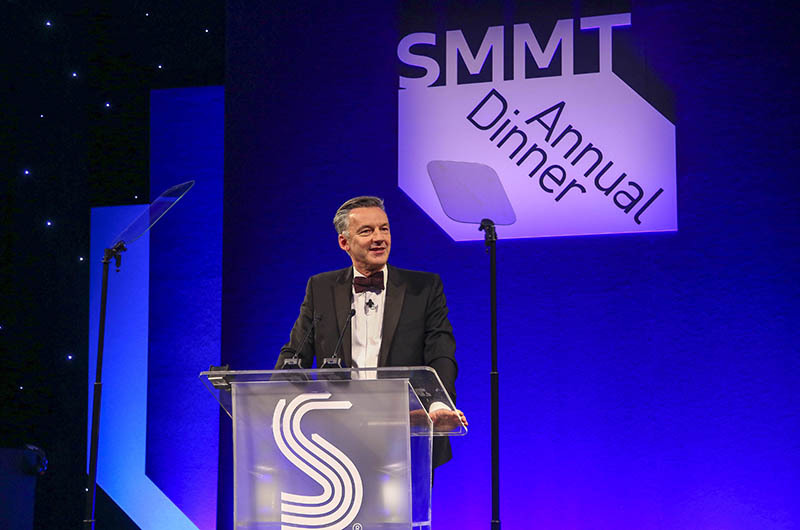 Three quarters of UK automotive businesses fear a ‘no-deal’ Brexit will threaten their future viability, according to a new member survey announced by the Society of Motor Manufacturers and Traders (SMMT) at its 102nd annual dinner in London this evening. The results highlight the critical need for a Brexit withdrawal deal and transition to prevent the industry falling off the cliff-edge on March 29 when the UK leaves its largest and closest trading partner, the EU. Mike Hawes, CEO SMMT, speaks at the SMMT Annual Dinner at the Grosvenor House Hotel, London. 74.1% of companies with UK operations responding to the survey said that a ‘no-deal’ scenario would damage their business, with fewer than 9.0% foreseeing any positive impact. More than half said their operations have already suffered as a result of uncertainty about future trading arrangements. Almost a third said they had postponed or cancelled UK investment decisions because of Brexit, with one in five having already lost business as a direct consequence. More than half of firms said contingency plans are now being executed, with over one in 10 (12.4%) relocating UK operations overseas and the same proportion already reducing employee headcount. Many have also made alterations to logistics and shipping routes, investment in warehousing and stock and adjustments to production schedules. SMMT members also outlined the further and long-term damage that a ‘no-deal’ Brexit would do to their businesses. Almost seven in 10 (68.5%) said their profitability would be negatively affected, with 53.9% concerned about their ability to secure new overseas business and a similar number worried about maintaining investment in their UK operations. A further half said a ‘no-deal’ scenario would undermine their ability to maintain their existing workforce. Automotive is one of the UK’s most valuable assets, employing 856,000 people and delivering £20.2 billion to the economy. Since 2010, car production alone has risen by a third, with 1.67 million cars leaving production lines in 2017 – 80% bound for export, most to the EU. Over the same period, the number of jobs supported has risen by 120,000. This growth has been dependent on free and frictionless trade afforded by the single market and customs union. A no-deal Brexit would bring an immediate end to the seamless movement of goods, resulting in disruption at the border and delays, throwing Just-in-Time manufacturing into chaos and undermining the competitiveness of the sector – ultimately putting profitability and jobs at risk. Frictionless trade as part of the EU single market and customs union has driven the success of the UK automotive industry so the fact we are leaving is already painful, and already causing damage. Leaving without a deal would be catastrophic – plants will close; jobs will be lost. Leaving is not what we wanted, but we recognise that the withdrawal agreement has been hard-fought and, crucially, delivers a transition period which steps us back from the cliff-edge. We need a deal now, and we need an ambitious deal for the future that guarantees frictionless trade with our most important market – nothing else will do, and we urge all parties to remember what’s at stake. No deal is not an option. In the short term, crashing out of the EU would have immediate and devastating impacts, with border chaos disrupting the Just in Time basis on which our business depends. Disruption could last for weeks – even months. It is unimaginable that we could implement full WTO import and export procedures overnight. For the longer term, a ‘no-deal’ Brexit would harm our competitiveness, undermine sales and cost jobs… We need the certainty of a deal, not more uncertainty, and we need the smooth transition period based on current trading conditions. It is vital we have free and frictionless trade with common technical standards. Without these, we risk losing all we have achieved in building a world-class automotive sector. What impact do you think a ‘no deal’ Brexit will have on your business’ future prospects? Overall, what impact has Brexit had on your business to date? Have you planned, made, postponed or cancelled UK investment decisions because of Brexit? Have you won or lost new or existing business because of Brexit? Are you actively preparing for the UK to withdraw from the EU on 29 March 2019, with ‘no deal’ having been agreed? What do you think the impact of a ‘no deal’ Brexit will be on your business’ profitability? What do you think the impact of a ‘no deal’ Brexit will be on your business’ ability to secure new overseas business? What do you think the impact of a ‘no deal’ Brexit will be on your business’ ability and appetite to invest in your UK operations? What do you think the impact of a ‘no deal’ Brexit will be on your business’ ability to maintain the existing workforce? Survey results based on the responses of 182 SMMT member companies to an online poll conducted in November 2018.